Tyler Sebree joined the ABC 57 First Warning Neighborhood Weather Team in October of 2017. This is his third stop in his meteorology career. He worked at WTVO in Rockford, Illinois, and WLIO in Lima, Ohio, before joining WBND. Tyler has loved the weather and has wanted to be a TV meteorologist since age 5. While in elementary school, he learned all 50 states, their capitals and could draw the United States from scratch. He drew is own weather maps and made his own forecasts during his childhood, and delivered them to his grandparents quite often. 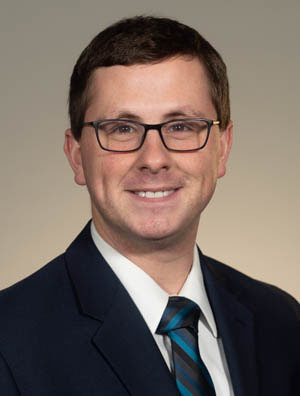 Tyler kept his enthusiasm for meteorology going strong through middle school and high school, and ultimately graduated from THE Ohio State University with degrees in Atmospheric Sciences and Psychology. While attending Ohio State, Tyler was a meteorologist for the student-run television station Buckeye TV. Events like large snowstorms, windstorms, severe weather, and hurricanes are Tyler’s favorite weather to track. He can’t keep his eyes off of his computer or phone when there’s severe weather. ; even if it’s not happening anywhere nearby. Tyler has chased storms multiple times, and he has witnessed two tornadoes in person. One of those tornadoes moved right over his vehicle and actually lifted his car a few inches off of the ground! When he’s not engaged in the weather or at work, Tyler enjoys traveling, exploring new places, craft beer, all types of coffee, and hanging out with friends on the weekends. Of all the places he has visited, he enjoyed Los Angeles, Las Vegas, Gatlinburg, Key West, and Myrtle Beach the most. You’ll also find him visiting theme parks like Kings Island in Cincinnati and Cedar Point in Sandusky quite frequently. 80-degree temps not far off; freezing temps a thing of the past? Is Michiana overdue for a derecho? Spring is here! So, when do those terrible allergens arrive? Deadliest U.S. tornado in 6 years hits Alabama; could it happen in Michiana? All eyes on weekend snowstorm; will it impact Michiana? El Nino is here, so what's ahead for Michiana? 2018: The first year without a violent tornado in the U.S. The big question: will we see a White Christmas? Why in the world is it so cloudy?